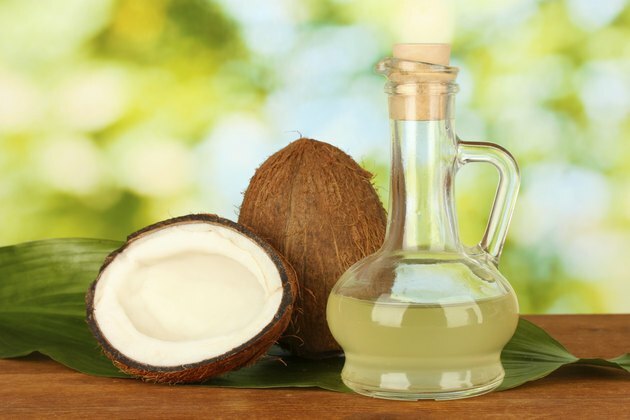 From softening skin to conditioning hair, coconut oil is prized as a topical aid--but the benefits of this ancient oil are more than skin deep. According to Coconut-Connections, consuming 2 to 4 tbsp. of coconut oil per day may offer a spectrum of health perks, including faster metabolism, improved thyroid function and greater immunity to disease. Such benefits make coconut oil an appealing fat source for those seeking weight loss and overall good health. With a little planning and creativity, you can integrate this oil into your own menu and consume it on a daily basis. Substitute coconut oil for butter or margarine--especially when baking or seeking a rich topping for bread. As the Tropical Traditions website explains, coconut oil hardens at temperatures below 76 degrees F, making it an effective replacement for other semisolid fats. Add 1 to 2 tbsp. of coconut oil to smoothies made with fruit, yogurt or other ingredients you enjoy. This will impart a rich, thick texture to blended beverages while helping you reach your daily goal for coconut oil consumption. Use coconut oil as your primary oil for high-temperature cooking methods, such as frying. Because coconut oil is comprised mainly of saturated fat, it's resistant to oxidation and stable in high-heat environments, according to Coconut Oil Central. Unlike unsaturated oils, coconut oil does not produce health-harming free radicals when exposed to hot temperatures and may be safely reheated multiple times. Eat coconut oil directly off a spoon, particularly if you've chosen to use extra-virgin coconut oil. Because this oil is naturally aromatic and flavorful, you may enjoy eating it by itself--especially if you like the taste of coconut in general. Consuming 1 to 2 tbsp. of oil straight from the jar as a snack can boost your energy and slay your hunger until your next meal. Consume coconut oil capsules. If you find the taste or texture of coconut oil unappealing or simply don't have time to integrate it into your meals, swallowing capsules is a convenient way to reap the internal benefits of this product. To avoid digestive distress, consume smaller doses of coconut oil throughout the day instead of ingesting your daily quota all at once. If a large dose of coconut oil each day yields unpleasant symptoms--such as nausea, an upset stomach or loose bowel movements--begin with a small amount of oil and gradually increase that dose as your body adjusts. Although nutrition doesn't vary considerably between refined and unrefined coconut oils, varieties labeled "extra virgin" possess a strong flavor and aroma and may be more palatable than tasteless, deodorized oils. If you have high cholesterol or heart disease, consult a physician before adding coconut oil to your diet. The oil's high saturated fat content may make it unwise to consume in high doses. Avoid coconut oil if you have a history of allergic reactions to coconut products. Because coconut oil has a relatively high melting point, it may not be effective as a salad dressing.